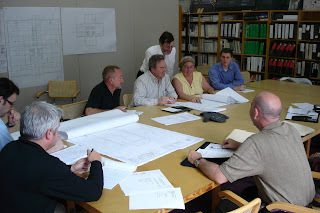 On Friday May 15th a big kick-off meeting took place at our architect's office. In addition to Clive our Architect there were representatives from the electrical and structural engineering companies as well as John our contractor. They started some "behind the scenes" work this morning and will continue with that for the next week. The day after Memorial Day is when the real excitement begins - - scaffolding starts going up! Stay tuned.